There's magic, there are airships and there is a talking cat. It can only mean one thing, I'm reviewing another 'Studio Ghibli' film. She didn't cause that, don't worry. Young 'Kiki' is a witch who is hoping to make it big in Koriko, using her unusual abilities to help the people of the port city. 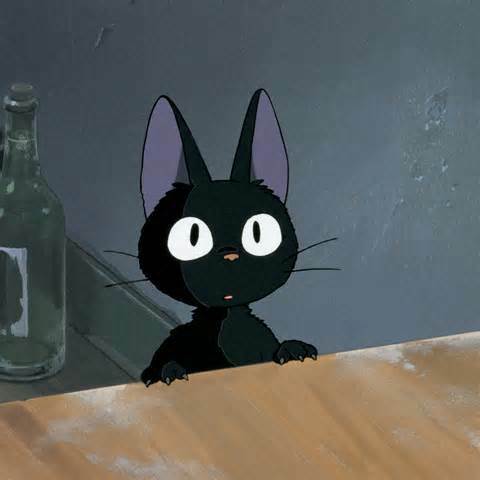 She brings Jiji in tow, her black talking cat, yes that's right another 'Ghibli' with cats, if I ever meet Hayao Miyazaki I will ask him, what's with all the cats? I would love to know the answer. Anyway, Kiki is an adolescent girl, so as you can imagine the plot follows the usual steps that most coming of age films follow. Witch meets boy, Witch doesn't like boy, Witch talks to cat for advice, Witch hits a big problem with her powers and boy and that's all I'm telling. This is the love interest, no really. What I've really come to respect from 'Ghibli' films, is that they can take a concept that is tried and tested and some would say tired and they inject new life into it. With coming of age stories they do just that, they find a new twist, a new angle and I really respect them for that. With this film we are given wonderfully layered characters who are funny, genuine and at times frustrating, because you know, listening to teens talk about boys and oh my God! Does he like me, why doesn't he like me, I hate him for not liking me, can get annoying, but that is what drew me in, it was real, it was genuine and none of it felt forced. 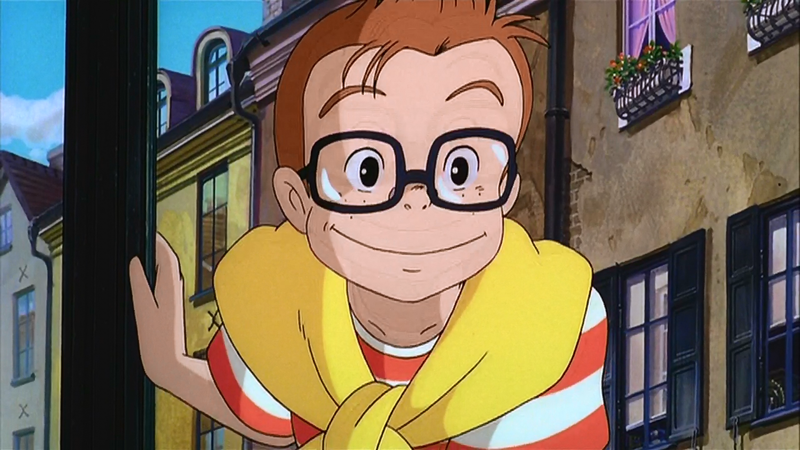 There was a great back and forth between Kiki, played by Kirsten Dunst and Tombo, played by Matthew Lawrence. Then there is Jiji, the cat, played by the late great Phil Hartman. Phil Hartman for those who don't know him played Lionel Hutz and Troy McClure in 'The Simpsons'. He brings such a dry humour to the role that he feels like, to me, the audience, watching Kiki make a fool of herself and give his very correct opinion about it. 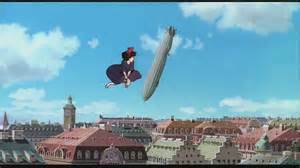 If this wasn't a 'Ghibli' they would be plunging to their deaths. As I stated before, this is a coming of age film, and as such it has all the trappings of one. 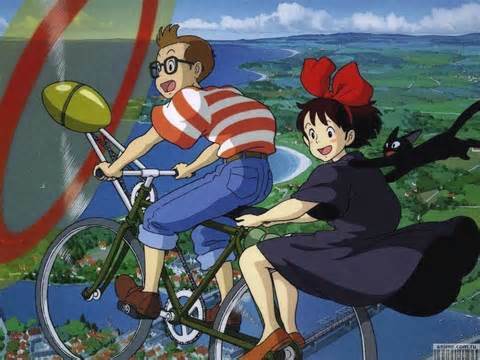 Ghibli do their best to get out all the cliches but even they can't do it. There were times where I was wishing Kiki would get over Tombo and get her confidence back, because lets face it she is 13, does she honestly think it'll last? I was teased with the idea of magic in this film which I will say was the main draw for me to watch this film, not long into it I realized that the world of witches would never be explained, that their rite of passage would never be fully explored and that stung a little, but that's just me. What do you mean I can't be in 'The Cat Returns'. It's a teen drama with a witch and her black cat, Sabrina it is not however, take that as you will, I'm going to take it as a compliment to 'Ghibli'. Teenagers with magic powers can be so silly.